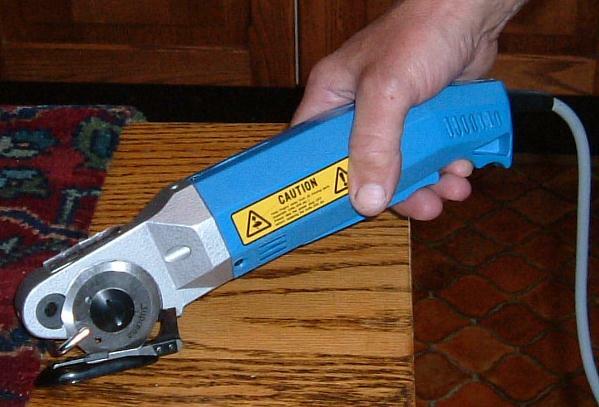 From time to time we get asked if we can supply electrically driven scissors. Due to the problems of repetitive strain injury, these devices are starting to play an increasing role in the workplace. As well as scissors (see separate webpage), we can offer much more powerful devices such as this Suprena 'Mini Tuff Cutter'. 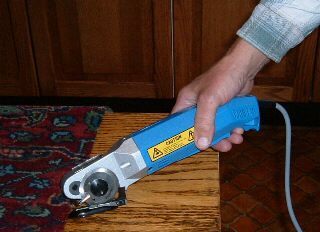 These are 240V mains powered devices with a razor-sharp rapidly rotating steel blade which acts against a lightly sprung tungsten carbide counter blade to give a scissor shearing action. The model illustrated is capable of cutting material in single or multiple layers up to 8mm thick, depending on what the material is made from. This machine will work on anything from silk to carpet to glass, carbon or even aramid fibre. In order to achieve this performance a gearbox is included in the drive train to reduce rpm and increase torque. There are cheaper models with less torque, but the HC-1015A model is, in our opinion, the best suited to fabric and fibre applications. 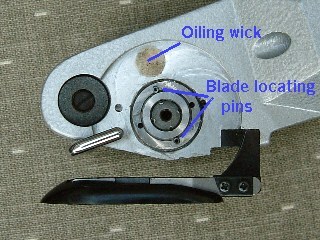 This is a close-up view of the business end showing the adjustable top-guide (the shiny bar) in place above the cutting gap. If you expand the picture by clicking on it then you will see a labelled version clarifying what is what. Whoops! Did a search engine bring you directly to this page? If so, you probably don't know who we are! (It's Aegis Advanced Materials Ltd, phone 01299-404153, in Worcestershire, England.) Click here to open our home page in a new window. The blade is easily removed for replacement (they cost about �16.00 ea) and is located on two driving pins. An oil filled felt pad is also behind the blade and if you are cutting 'sticky' fabrics should be kept topped up with the light oil supplied in the kit. 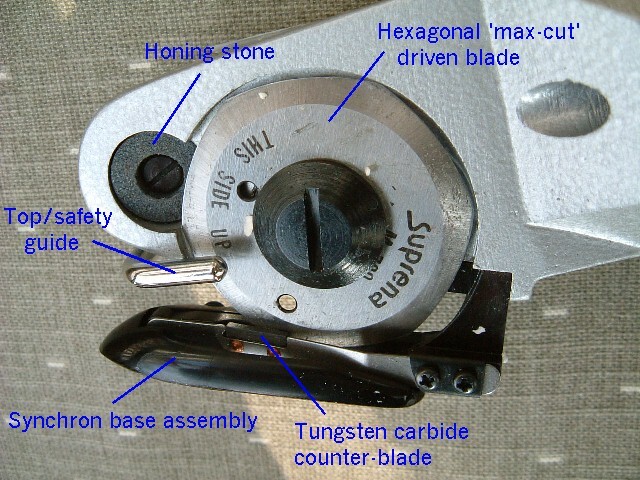 The standard steel blade is a hexagonal general purpose one, but circular and octagonal blades are available for cutting other materials such as thick paper or fabrics, aramids or glass-fibres. Coated blades are available for 'sticky' fabrics and solid tungsten carbide blades are available to special order. The guide price for the model illustrated is �355.00 ex-works, plus VAT, but please contact us for a quotation for a disc-cutter to suit your own requirements: there are other models with air-drive motors or without the extra gearbox. Price correct as at 1st September 2010.